To provide more effective dentistry, Dr. Khanna has incorporated some of the latest digital technology into his Geneva, IL dentist office. The T-Scan Occlusal Analysis device is the only tool that can accurately read a patient’s occlusion. Understanding the precise occlusion of each patient can prevent damage to the teeth or a new dental restoration. T-Scan is also helpful for treating TMJ and correcting malocclusion. T-Scan allows Dr. Khanna to evaluate the force and distribution of the bite. The handheld device is non-invasive and provides a precise occlusal analysis. T-Scan is designed to determine where teeth are coming into contact with each other and can pinpoint high force areas allowing for more accurate treatment. The Picasso Plus Dental Laser helps makes treating soft tissue dental concerns less invasive and more precise. From effective gum disease treatment to gum contouring and teeth whitening, laser dentistry improves the way patients experience dentistry. 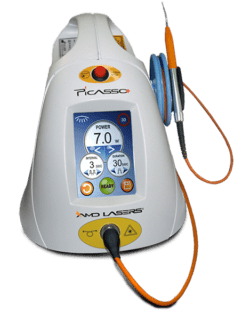 Picasso Plus Dental Laser reduces the need to use invasive surgical techniques when treating issues such as a frenectomy or reducing a gummy smile. Laser dentistry promotes natural healing and eliminates the need for sutures and long downtimes after treatment. The Pax-I SC from Vatech increases diagnostic and treatment accuracy. 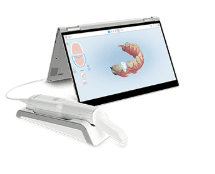 The digital panoramic & Cephalometric scanner provides highly accurate and detailed images of the jaws, teeth, TMJ, and airway. The high-quality images allow for enhanced details and for better diagnosis of developing dental concerns. Many patients, especially younger patients, are very familiar with the latest technology and are more comfortable with the high-tech practice. Computers and TV screens are their primary method of information processing. Dr. Khanna utilizes intraoral camera technology that helps enhance your understanding of your diagnosis. An intraoral camera is a very small camera. In some cases, an intraoral camera is just a few millimeters long. This tiny camera allows Dr. Khanna to view clear, precise images of your mouth, teeth, and gums, in order to accurately make a diagnosis. With clear, defined, enlarged images, you see details that may be missed by standard mirror examinations. This can mean a faster diagnosis with less chair-time for you! Intraoral cameras also enable Dr. Khanna to save your images in our office computer to provide a permanent record of treatments. These treatments can be printed out for you, other specialists, your lab or insurance companies. Dr. Khanna chooses carefully which and when radiographs are taken. There are many guidelines that we follow. Radiographs allow us to see everything we cannot see with our own eyes. Radiographs enable us to detect cavities in between your teeth, determine bone level, and health of bone. We can also examine the roots and nerves of teeth, diagnose lesions such as cysts or tumors, as well as assess damage when trauma occurs. 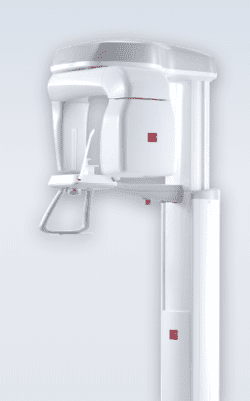 Dental radiographs are invaluable aids in diagnosing, treating, and maintaining dental health. 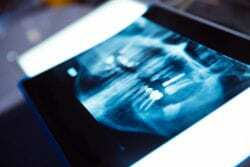 Exposure time for dental radiographs is extremely minimal. Dr. Khanna utilizes digital imaging technologies within the office. With digital imaging, exposure time is about 50 percent less when compared to traditional radiographs. Digital imaging can also help us retrieve valuable diagnostic information. We may be able to see cavities better. The advantages of digital imaging enable us to not only store patient images, but also to quickly transfer them to appropriate specialists or insurance companies. Digital x-rays offer more precision since we view the image on a computer monitor, instead of holding up a 35mm film to the light. Digital x-rays result in one-sixth the radiation exposure for you. 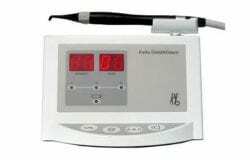 Dr. Khanna and his Periodontal Therapist use a tool to accurately detect dental decay. 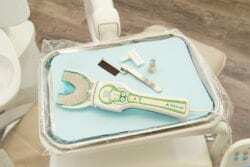 A small hand held instrument passes light through enamel and measures fluorescence. Any decay or weakening of the enamel surface will produce some fluorescence by the light and will be detected by the instrument. This will provide us with early detection of dental decay, and will result in more conservative treatment, and cavity prevention. A beautiful, attractive smile always leaves a lasting first impression. Unfortunately, most patients are not able to see this unless they go through treatment. One of the things most patients would like to see is an image of their smile and teeth before they are restored. As a result, we have implemented an imaging software that allows you to see what your smile and teeth would look like after they are restored. The results are remarkable. Realistic, life like images. There are many advantages for offering this service. The most important one, is the ability for our patients to evaluate the final result before even beginning treatment. Our patients then have the opportunity to give us feedback on how they feel, and make any changes that are suitable. This software allows us to do many things that include whitening, straightening, and smile improvements. The response has been extremely positive, and our patients love seeing the before and after photos of themselves. If you, your friends, or family member would like to experience esthetic imaging, please call our office.